Jan 6th, 2016: The weather forecasts are still contradictory. There is another possible clocking of winds through west, but after naps, we decide to move to Black Point since it is no more or less protected than Big Major. We motor sail on the genoa & one engine at reduced throttle the 10 miles on a beam reach. The waves are hitting us on our beam which is usually preferable but the banks aren't happy and it's a short but rolly ride. We only see 6 masts as we enter the channel and drop in line between sv Sasha and a Lagoon. Still punch drunk from an anchor watch of 25-30 gust 36 the night before, The Captain increases his normal 7:1 scope to 10:1. We decide to head into town for errands and a decent meal. We tie up at the government dock alongside 3 other dinghies. (It's a tall dock. Standing up, I can't reach the dock above my head, so I wrap the painter around the ladder and climb up. The Captain resecures it to a piling). We head towards a restaurant called Scorpios, noting the trash dumpster, water spigot, bakery and grocery store on our way (fresh eggs!). There is a table of cruisers at Scorpios as we arrive. They invite us over, but after a night of anchor watch, we don't have the energy. We order drinks and food. Pretty soon, their party breaks up and we chat with them as they leave. One couple stays behind (spoiler alert. sv Sasha) and we chat across the aisle. A quick rainshower comes through, so the bartender asks us to relocate inside. Not much later, a local comes in and asks if it's "our inflatables at the dock because they are in danger." The men rush out and the girls stay behind to wait for our food. Someone comes in and says a big boat is on the rocks, so I throw my purse on Sasha's table and run out the door (I later learn a local lost his "big powerboat.") When I reach the dock, I see waves coming over the dock and no sign of the boys. I can see our blue stern light still out in the anchorage. It's getting dark, so I run back to Scorpios just as the power goes out. More locals stagger in and our food finally arrives. An eternity later, the boys return. They are soaked. The Captain's new glasses blew right off his face. They moved one dinghy to the other side of the dock and our dinghy to the beach. (He'll explain later that as the dinghies came up on the 4-6 ft waves, they were "flying" in the air. While trying to move our dinghy down the dock, the outboard smashed up into the dock and the painter flew out of The Captain's hand. 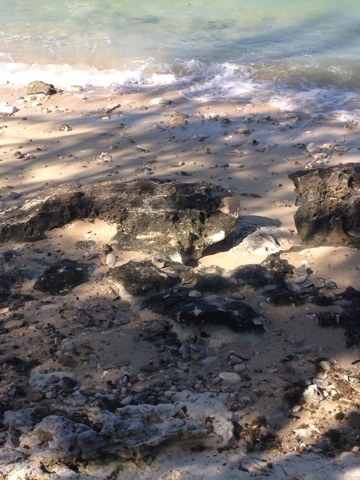 Luckily it went straight up on the beach, where locals helped secure it to a chunk of cement with chain attached.). We discuss the real possibility we may not be able to get back out to the boats tonight if it doesn't let up. We chit chat about other things--anything except our homes that are in imminent peril and there is no way for us to get to them. It turns out R is a pilot so that keeps us occupied for awhile. We settle up and the bartender says he will help us find somewhere to stay in town if need be. We take turns poking our heads out the door until, finally, the lights come on. The winds seem to have let up, so we walk down to the dock to check things out--"just for fun." The dock is missing a lot of boards and there are pallets from today's mail boat strewn down the dock. 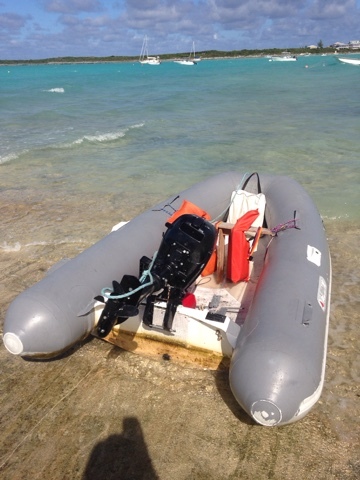 Our dinghy is still on the beach but Sasha's brand new AB is not where he left it. 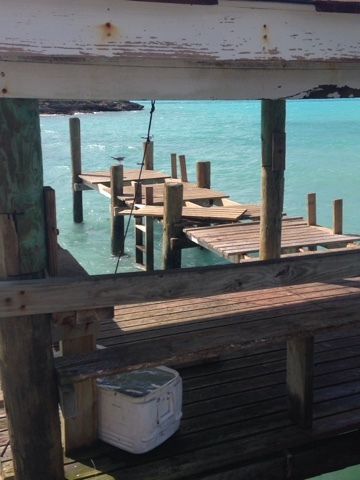 The locals coax us off the damaged dock. Other locals find it washed up on the rocky beach. The aluminum hull is dented with a rip where the inflatable meets the hull. A large group helps drag it up and around to the other "marina" beach. Our outboard is in multiple pieces. 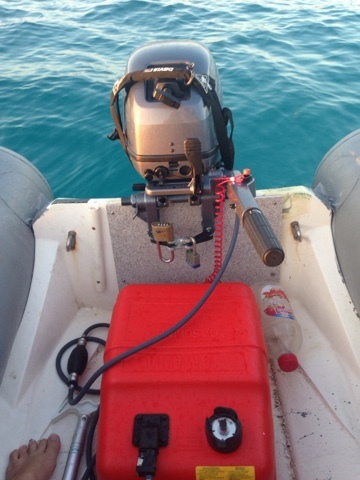 Sasha's outboard is a little damaged (bent prop) but still runs, so they move it onto our dinghy. A local helps drag our outboard inside the government building--a little tricky with a broken lower cowl. The water is almost calm now. All four of us pile into our dinghy and they drop us at our boat and continue onto their boat. (Pic Anchor app) The cat is asleep but the boat is no worse for wear. I had closed up anticipating rain and everything was still stowed from our sail except for two drinks on the salon table. We head to bed after confirming the chartplotter & anchor alarm agree we are still where we were. (Pic) About 2:00 am the winds shift to the NW at 20 kts, making our home a bouncy castle again (Black Point not protected from the west). We can't sleep and The Captain decides to sleep in the salon, while I stay up until sunrise reading other's accounts on Facebook (see below). (Pic) Our chartplotter trick--one of the interesting things about reflecting on this storm was, how do you know if you're dragging? We've tried several anchor alarms with mixed results. We currently use the "Anchor" app, but still get the occasional false alarm. Our secondary anchor alarm is: When we drop anchor, I create a new waypoint named "anchor". When the anchor bites (I can feel it in my bare feet or I see a bow swing away from the wind), I create a second waypoint named "bite". Finally, when the bridle is on, I make a last point named "bridle." This gives a line that should represent our swing radius. If the winds shift, we add another waypoint (in a 360 degree windshift, you should have an equidistant circle around the anchor. If we get a gust that stretches the chain, we create a waypoint to show us the new radius). If the anchor alarm goes off, a quick glance shows if we are inside or outside our last mark or if we've swung to a new position (reason to be watchful). Of course, when you are not on the boat, this technique falls apart! We're still relatively new cruisers, but The Captain is a certified aircraft mechanic & IA. Redundancy and safety wire/zip ties are all over Odin. I quizzed him on our setup after hearing about some of the failures (I'm embarassed to admit, besides the ocassional conversation while buying parts, I was blissfully uneducated on our current set up). For what it's worth, here is our anchor set up--straight from the Captain: "Primary anchor 44 lb Mantus with 120 feet 5/16 G4 chain + 200 feet 5/8 rope. Primary Bridle: Mantus chain hook with 2 25 foot 1/2" three strand nylon lines connected to chain hook with 3/8 shackle. 1" water hose for chafe protection at chocks. Secondary bridle: 5/16 chain hook with 5/8 double braid eye splice looped over port cleat. All shackles safetied with nylon zip ties." Our old primary anchor was going to be connected to the rope rode in the starboard bow locker, but we left Brunswick before this was completed. "Perhaps I should get that done." We used to worry about dragging, but our new #Mantus anchor has been solid, so now mostly we worry about others dragging. However, we heard several stories of other cruisers having bridles FAIL, chain paying out uncommanded and LOSING anchors! Nightmare! That will keep me up at night. Another bad contributing factor here was, it was after dark. Everything is more difficult in the cockpit and on deck in the dark. It will be a long while before I am comfortable going into town after dark. God bless the locals who were on the beach looking after their own property and stopped to help us. "That's what we do." The day after (7th): After sunrise, I finally fall asleep for a few hours. We finally get coffee and breakfast by 9:00 am and hail Sasha on the radio. We're on the beach by 11:00 am with a bag of tools and discover Sasha's dink has 3 tears, only one major. They air it up, bang out the hull & work on the leak. Next is our outboard. The Captain was confident he could get it running but in daylight, it's a broken carb, broken intake, broken lower cowl frame, broken lower cowl mounting lug is broken off at crankcase, bent prop, and a missing gas cap. He figures it needs $800 worth of parts. I walk down to retrieve our aux fuel tank from a local business owner who took it for safe keeping. We make a quick grocery store stop and upon return, we have two dinghies again (kind of). Sasha tows us out to our boat then returns with their spare trolling motor to loan us. Guess we'll be seeing them in Georgetown! "StanielCay reported (confirmed independently from multiple sources) W-NW@45-50 with gusts at least into the 60s from about 6pm-7:30pm EST. CambridgeCay (about 20mi N of StanielCay) recorded a gust which registered 106.2k on an anemometer. Even if not precisely correct, there were almost certainly Hurricane Force wind gusts. Most reports were a bit less...mostly W-NW winds in 30-40k range, gusting 50k+ persisting about an hour+/- generally between the hours of 5pm-8pm in RoyalIsland & RockSound Eluthera, various locations near GreatExuma/LittleExuma." "In 13 years, I don't think I've seen an event like this in the Bahamas. Although there was some fairly strong convection (Lifted Index -4 to -6, and CAPE 1000 to just under 2000), there were no very tall (cold) cloud tops. Infared Satellite cloud top temps were only about -20C TO -30C, suggesting cloud tops probably in the range of 20,000' to 25,000' or maybe a bit higher. In order to generate observed winds, I would expect cloud top temps below -50C, and cloud tops well above 40,000'." "If we pick a point along TROF W of Andros (24N/80W) at 10am...and follow TROF E thru Bahamas (to 24N/73W) at 10pm, it covered about 400 miles in 12 hours, moving about 35k. As TROF began rotating around the LO which was developing just NE of Eluthera, the S portion of TROF/convergence moved more rapidly than the N part (closer to the developing LO)...and TROF/convergence gradually became more NNE-to-SSW-oriented. But throughout the day our TROF/convergence spanned about 300-400 miles from NE-to-SW (or NNE-to-SSW)." I can't be sure what we saw was a Derecho, but it was certainly (thankfully) a rare event." Day 3 (8th): I'm feeling a little emotional this morning. Perhaps the adrenaline or shock of the last couple days has worn off or maybe I finally got a good night's sleep. I was awoken by a pan-pan at 4:30 am this morning. One of the boats set adrift by the derecho is on fire at a wooden dock in Staniel. A pumper truck was supposed to be on the way, but everyone was at the boat on the rocks on the other side (Big Major). Day 5 (9th): Pick up new ouboard. Dinghy taking on significant amount of water. Had to start bailing halfway across Elizabeth Harbor. Temporary transom repair. Day 6 (10th): The hits keep coming. 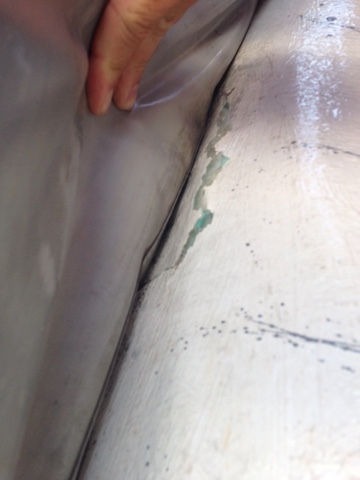 We discover the source of the leak while snorkeling--a 6" rip in the fiberglass hull. Temporary fiberglass repair. Day 8 (12th): Another run into town with Sasha for parts. They are hoping to resplash soon. Insurance paperwork initiated. We aren't always the social butterflies at an anchorage. But we are usually very familiar with every boat in our immediate vicinity for various reasons. I like to people watch. We peek through our binoculars to check their boat name & hailing port. Then we play name-that-boat. "That's a Switch 51. Very rare. Cool boat." We rarely participate, but we listen to the radio chatter. We follow their comings & goings because we try to run the generator when are neighbors are in town (or just so we know where the dinghy dock is). Ocassionally we'll check to see if they have a blog or facebook page. Some boats we've seen at several anchorages get nicknames like "red dinghy" or "Hatchet Bay schooner." (When our dinghy is in the davits, you can't see our boat name. Apparently, were were "little cat" while anchored behind the grotto. Yeah, not the Lagoon!). We check where all the boats are at sunset (who does and who doesn't have on their anchor light). At sunrise, I pop out to check ours and all of our neighbors positions. "Hey, Island Packet left!" Our anchorage is our village. It changes day to day. We may not know their names. But one day we'll run into them at a bar and say, "yeah, you were anchored next to us in...." So hearing the boat names of those who drug, ended up on the rocks and caught on fire was devastating. We never met, but they are still our people. Cruising is a small community. Wow! What a way to be welcomed to the world of serious cruising. Glad you are all OK and the mothership is fine. Too bad about the dink and outboard. Wishing you a speedy recovery and only good fortune from now on.